I have already said that I have been researching my ancestry pretty well all my life. Its taken me to many places, one of which was Flete House in Devon, where I was given a tour around the old house. 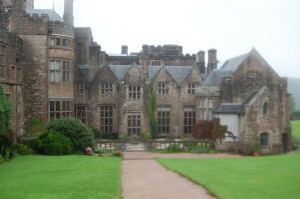 The land and old buildings were once in Prideaux hands. This Prideaux killed one of the Bigburys at Sequers Bridge but I shall tell that tale another time. The house was my inspiration for Finders Hospital. It was easy to imagine the townspeople coming in and out of this place and that night on the lawn.